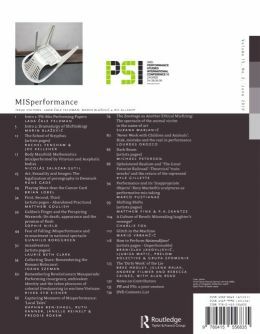 MISperformance is the first of three issues that Performance Research will produce in association with Performance Studies International, and in collaboration with the annual hosts of the PSI conferences 2009 – 2011. Each issue will respond in different ways to the theme of the conference. 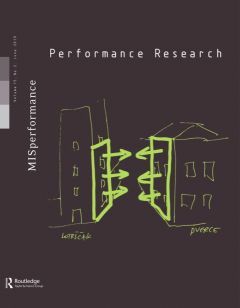 PSI#15 (Zagreb, June 2009) asked the question ‘Is misperformance a supplement of the Performance Studies paradigm – a concept, an event, an effect that was always there in various theoretical underpinnings of the discipline, yet somehow never fully at the center of the debate?’ The MISperformance issue provides an insight into the various strands of this reflection, ranging from issues of political misrepresentation, via questions of mis-spectatorship and artistic abstinence, to aberrant pathways of documenting contemporary performance practice, and, well ... downright lies! Alongside the conference theme, PSi#15 introduced the format of ‘Shifts’, experiments at the intersections of various modalities of performative presentations; hybrid collaborative platforms inviting both artists and scholars to jointly (mis)perform in-between conventional modes of making a conference, doing art, being an artist or an activist, being a scholar or a curator. The MISperformance issue will include a DVD following the curatorial strategy and program of the PSI#15 Shifts. A Culture of Revolt: Misreading laughter’s revenge?